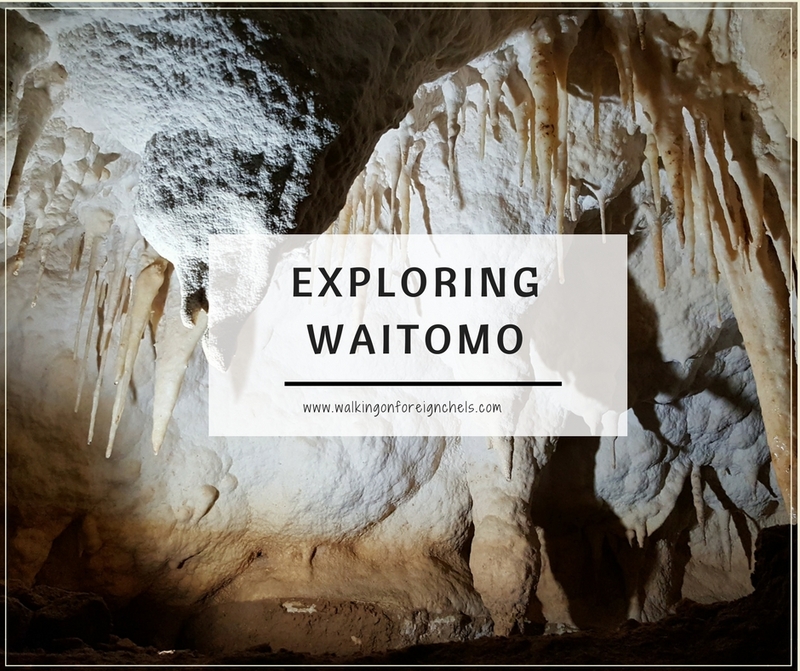 We recently spent the day in Waitomo, exploring the area and some of the caves there. It’s only a 45min drive from where we live and it’s been almost 2yrs since we were last there so decided it was high time we got back over there! 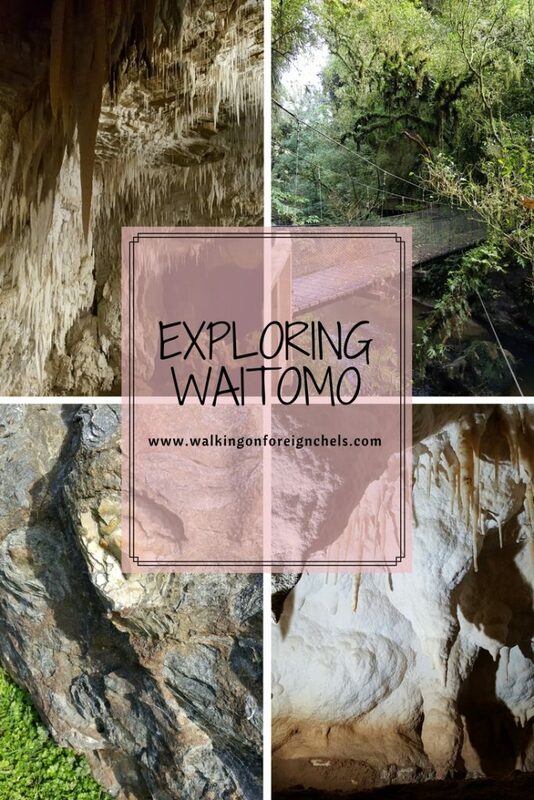 Last time, we went to the main Waitomo Cave which is the most famous glow worm cave here in NZ. Both hubby and I have been a number of times over the years but it was our first time there together. 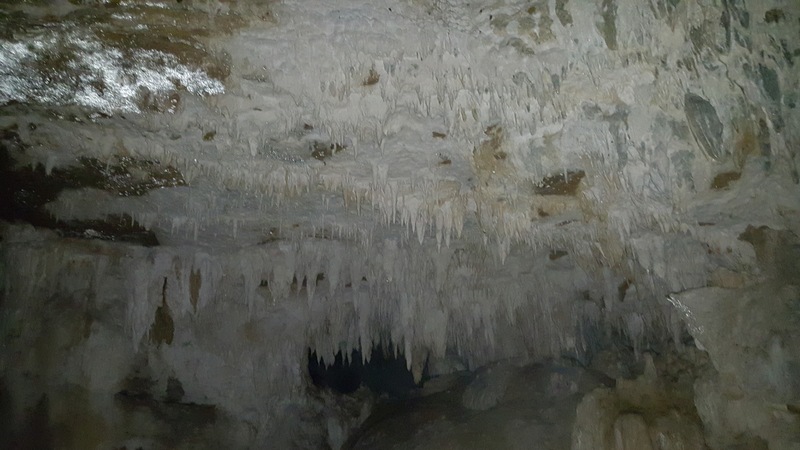 It’s expensive for what it is and quite a short tour – around $50 for 45mins and the groups are quite large plus they go in 15 min intervals so there are usually a number of other people within the cave system. But the thousands of glow worms at the end are amazing to see. 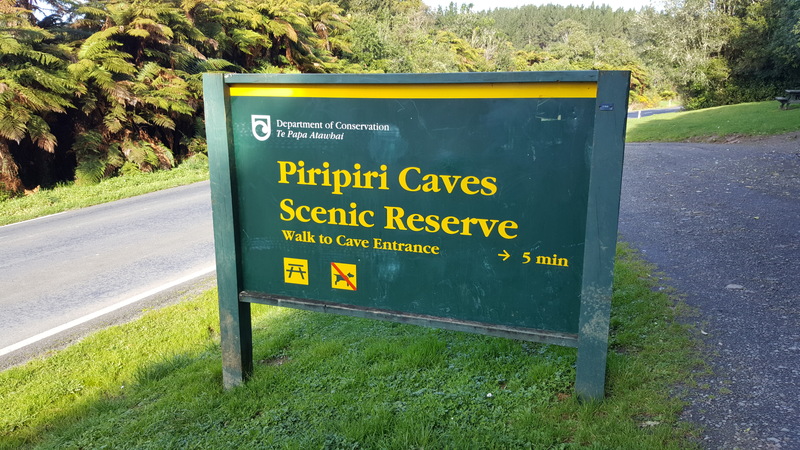 This time around we decided to visit the Piripiri Cave, the natural land bridge, Ruakuri Cave and the Ruakuri Cave Bush Walk. 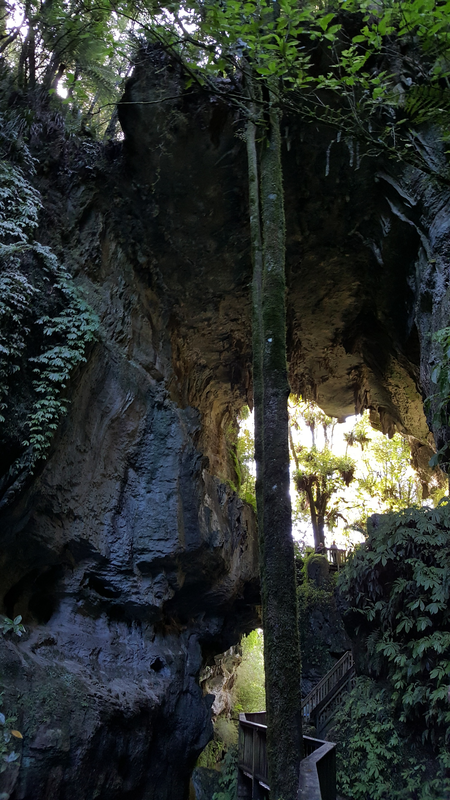 It’s only a short walk to the cave from the carpark, but it’s a beautiful walk through thick NZ bush and natural limestone formations. When we arrived at the cave we were the only ones there so we had the whole place to ourselves which gave us enough time to stand around for 7 mins to let our eyes adjust to the darkness. There are no glow worms in this cave and it consists of only one chamber with some steps leading down to 2 platforms at different levels. 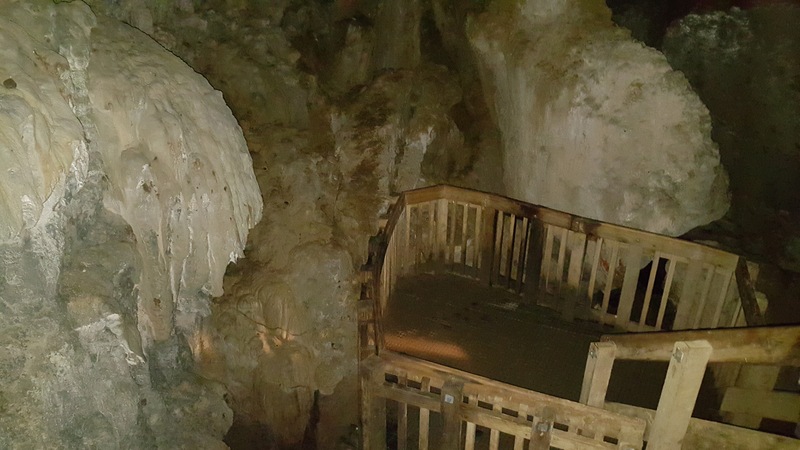 We could see what looked wooden boards on the floor of the cave leading off into another chamber but there is no way of getting down there now. I looked for remnants of an old stairway (as the current one looks quite new) but couldn’t see anything, so I’m not really sure what was there previously – but I’d sure love to know! This was really cool! We’ve been to one in Tonga and we walked across the top of that one, looking down – this one we walked in from below, looking up at the bridge. There is a loop track that takes about 20mins or you can just walk to the 17m high arch and then turn around and go back the way you came, which takes about the same amount of time. 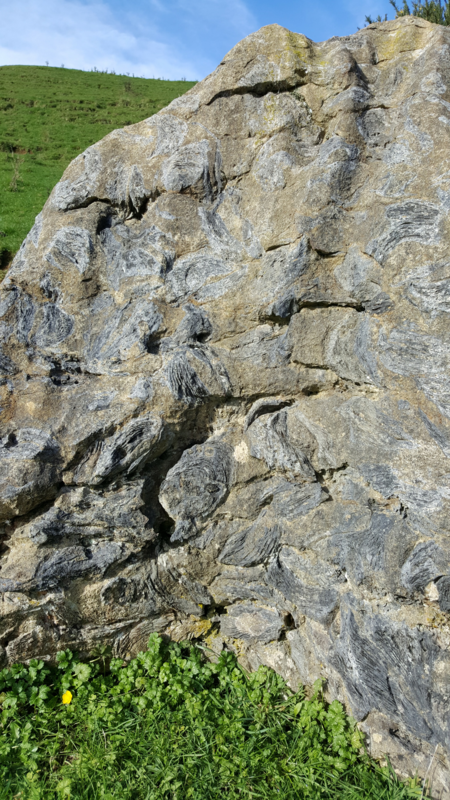 We chose the loop walk which took us through the limestone gorge, through to the arch and then into farmland where we got to see fossilized giant oyster shells in the rocks dotted around the farm. I will warn you though – when they say “giant” oyster shells we’re talking like the size of your whole hand, maybe slightly larger. I was expecting something much larger! More along the lines of the giant clams I’ve seen in Rarotonga so I was a little disappointed by this. Super cool cave! 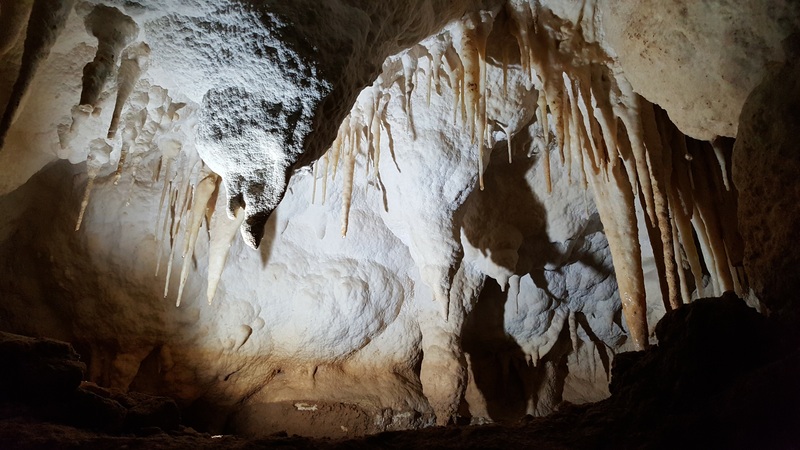 You have to do it as part of a guided group but the groups are a bit smaller than the ones that go through the Waitomo Cave, however, it is more expensive but my personal opinion is that it is way better and definitely worth the money. It costs about $74 per person and it last for about 1.5-2hrs. 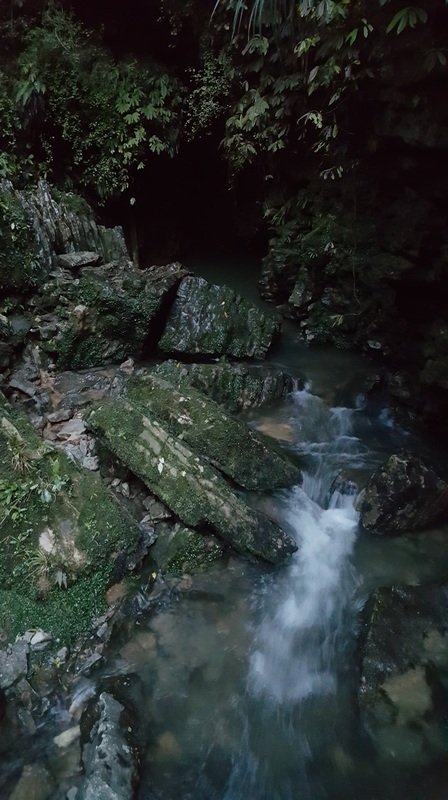 The cave system is incredible, so impressive and you do get to see glow worms along the way as well – if you have to pick one while you’re there, pick this one! 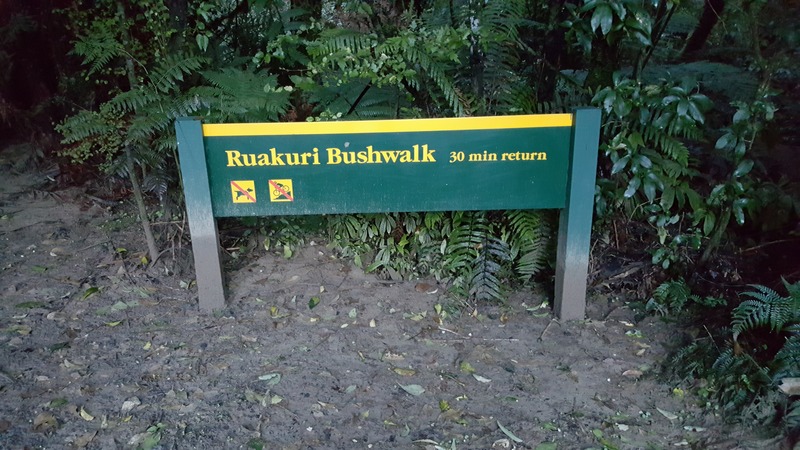 Ruakuri means “den of dogs” after 2 wild dogs were found making their den in the entrance to the cave system. It was first discovered 450-500 by the local Maori but did not become a tourist attraction until 1904 when James Holden acquired the land from the NZ government when he settled here from England. 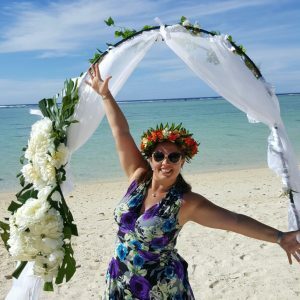 The entrance to the cave is a sacred burial site and a Tapu (blessing) was placed over area and is no longer used as the entrance to the cave, no one is allowed in that area any more. 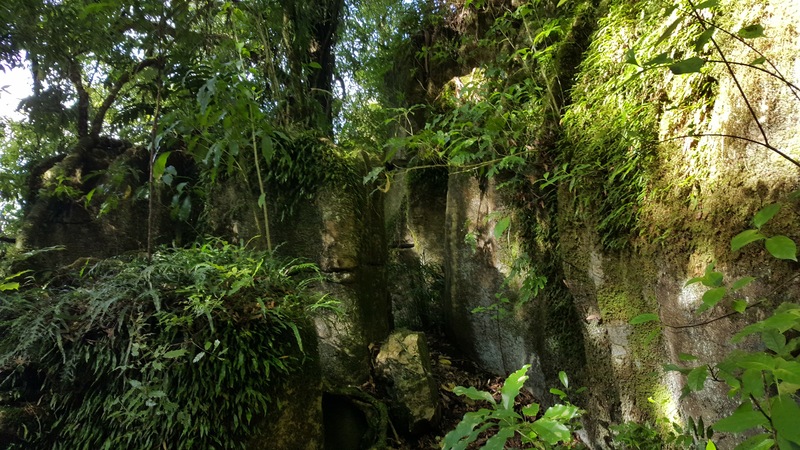 There is an interesting story surrounding the ownership of the cave that we learnt about while we were there and from what I remember, James Holden opened the cave to the public as it was on his land. The NZ government found out and decided that Holden only owned the land above ground and therefore took over the tours, pocketing the cash. In 1988 the caves were closed and a lengthy legal battle took place in London which determined that the Holden family did in fact own the cave as well but not all of it. 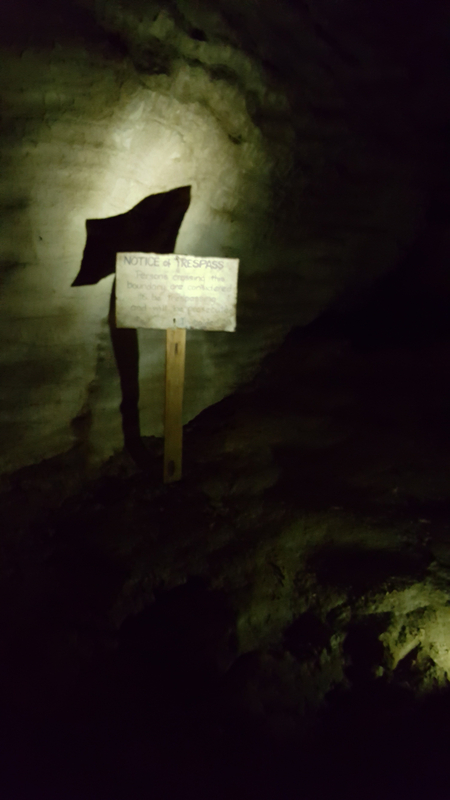 The cave was reopened in 2005 and is still on Holden family land now and there is actually a trespassers beware sign in the cave that has been preserved which was originally placed there by James Holden. 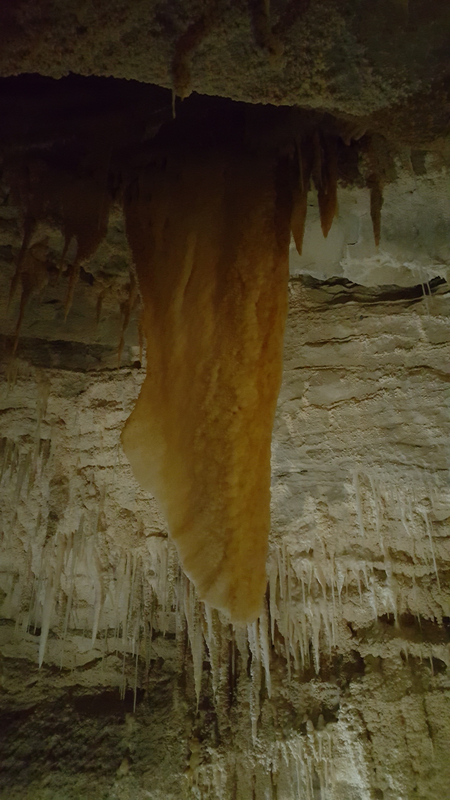 The cave itself has amazing limestone formations, hidden waterfalls and a river running through it (you can do blackwater rafting tours through the rivers) and plenty of glowworms to see as well as some cool fossils from when the whole area was under water. This is a really neat loop walk and it’s best to do it at night. We went in around 5pm so just as it was starting to get dark and we got to see about half of the walk in daylight which was cool as there are some really cool things to see. 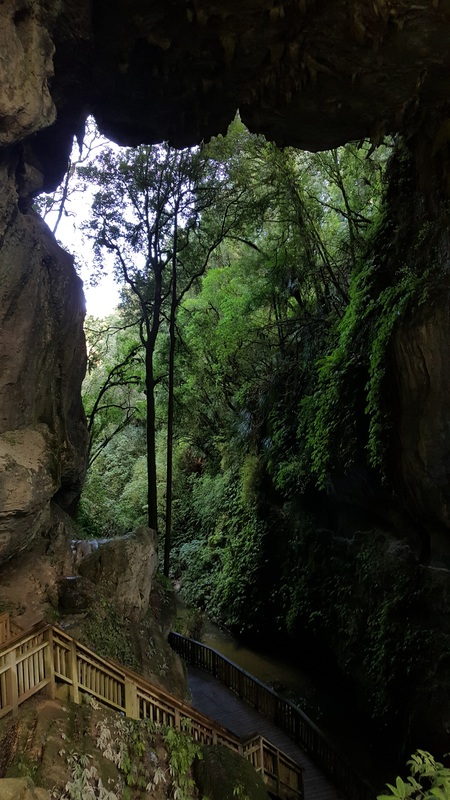 There are some cool cave formations to go inside and tunnels to walk through before you get to the best part – gorge walls covered in green/blue twinkling glowworm lights! It’s awesome as you can get up close to them and see their threads hanging down to catch food – if you do this, don’t shine your light directly on the worm though or their light goes out, it does come back pretty quickly but I imagine they don’t enjoy it all the same! The walk itself takes about 45 mins but I think we were there for about 2hrs just looking at all the glowworms and the best thing about the walk – IT’S FREE!!! 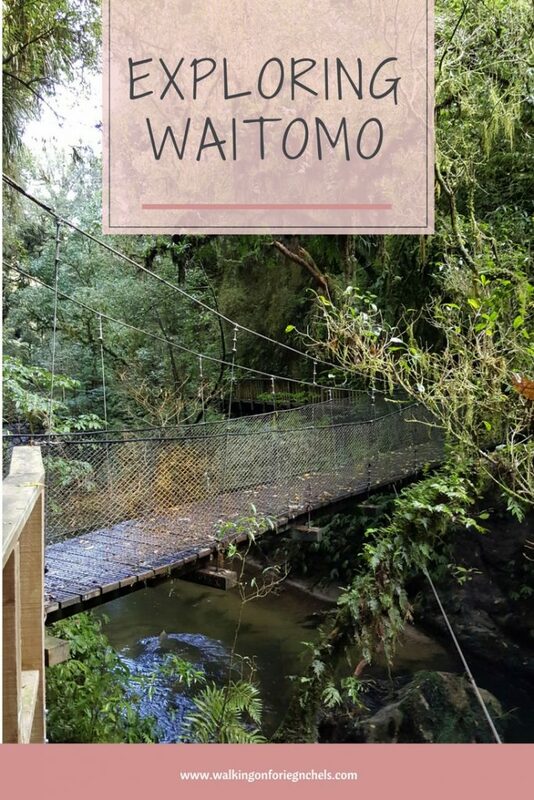 The whole Waitomo area is a great place to visit so if you’re in the area – make sure you stop in for a night or two! The Waitomo Caves Hotel is an old Victorian style building, built in 1908 and is the most haunted hotel in NZ. You can read about the hauntings here. 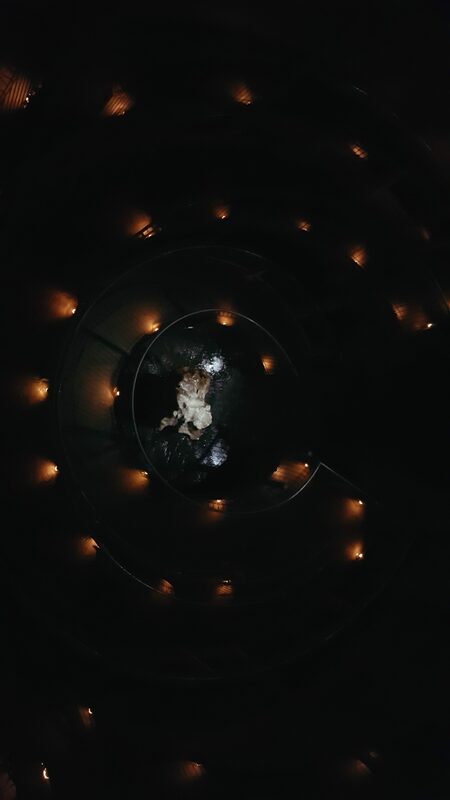 I’ve always wanted to stay here as it looks so beautiful from the outside but I haven’t gotten round to it yet, so if you do – let me know how it was and if you experienced any of the ghosts! But, if ghosts don’t tickle your fancy there are plenty of other places around the area to stay including a campground and some luxury B&B’s. There is only limited shopping in the area so if you’re staying, come prepared! There is no supermarket or even a dairy (corner shop) around here but there is a cafe which also sells a very small selection of household items. Luckily you’ll find a few restaurants to choose from. 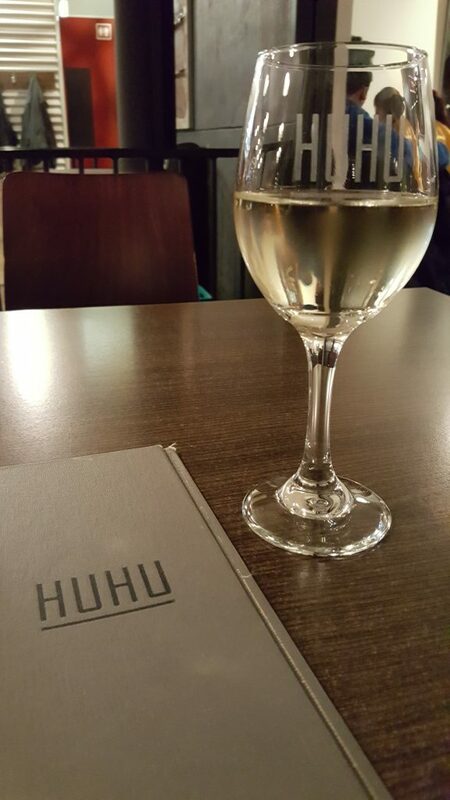 I’ve only ever been to Huhu Cafe and the food there is amazing. It is a small cozy place to eat, especially in the winter when they have the fire going. They also have a little A-frame apartment thing outside that can be rented. It looks really nice in there, with a sky light above the bed to look at the stars. Loved the post. Extremely detailed with good pics 🙂 Feels like i’m on the journey with you. Great guide, especially for the other things to do around there! I can’t wait to take my partner and boys back there!